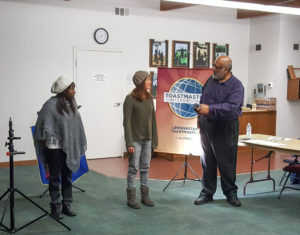 On February 20, 2019 Lensmasters held an open house with regularly attending members plus an additional 8 guests. We heard from member Luz Soto as she delivered the speech “The Meaning of Toastmasters in My Life.” John Hawkins spoke about how “Everyone Can Pose Better to Look Their Best.” After a short break, John held a demonstration of how to pose your subject for flattering results. We paired up and took turns directing each other as “photographer” and “model” to practice the techniques. The evening was great fun and we all learned a new skill that can be put to practical use the next time we are out photographing our friends and loved ones. Part two of John’s class is scheduled for March 20. The challenge for this meeting was to evoke an emotion in your image.